COMMENTS: Both stars are golden-yellow or perhaps orange in color. One star barely outshines the other. This was the first star(s) to have its distance measured (11.2 light-years). COMMENTS: The primary star in this system is a brilliant shade of blue. The companion, dimmer by several magnitudes, is a gray looking star. COMMENTS: This trio doesn't have stars of striking colors or brightness', but is still interesting. 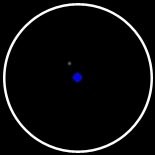 The brightest star appears to be blue. The other two stars are equal magnitude and gray in color. Several other stars are visible in the field of view (not pictured). It leads me to believe that this may be a sparse open cluster. COMMENTS: The bright star is golden-yellow. The other star is much fainter and grayish. Pretty average looking double star. COMMENTS: The primary is a brilliant white, while the companion, fainter by several magnitudes, is also white, but not as "shinny". MAGNIFICATION: 417x LOCATION: Kalamazoo Twp. COMMENTS: To date, this is the tightest pair I have observed. Both stars are bright white and equal in magnitude. COMMENTS: This double star is also similar in appearance to Albireo. The brightest star is yellow. The fainter star is a deep ocean blue. COMMENTS: The brightest star is blue. The other, while also blue, is slightly fainter that its counterpart. COMMENTS: Interesting pair. The brightest star is light yellow. The secondary star is dark red or orange. MAGNIFICATION: 357x LOCATION: Kalamazoo Twp. COMMENTS: I think this is perhaps the most difficult double star on the Astronomical League list. After close examination I believe managed to resolve it into separate stars. Both stars are light blue, but one far outshines the other. Whew!